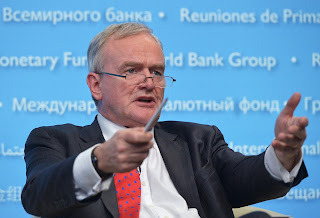 Citi's global chief economist, Dr Willem Buiter, speaking on Friday at the Asian Monetary Policy Forum at the Shangri-La Hotel warned of an "explosion in leverage". "Look at the US. No cross-sectoral learning has taken place," he said. "Yes, leverage is more or less under control in the banking sector because it was hit hard by regulations... but we see corporate debt, especially at the junk end in dangerous territory, with risk wholly underpriced." Commercial real estate lending has exploded in a way that is not compatible with the future path of occupancy rates, he said. while not leveraging up through mortgages again... are now leveraging up through credit cards, subprime car loans, student loans and the rapid expansion of credit through shadow banks, which are not on anybody's radar." Buiter is correct on these points but he fails to state that the debt explosion is the direct result of Federal Reserve manipulation of interest rates.